Hong Kong and southern China under red alert as biggest storm of the year makes landfall near Macau. Hong Kong and southern China braced on Sunday as strong winds and heavy rain from Typhoon Mangkhut lashed the densely populated coast, a day after the biggest storm of the year left at least 36 dead in the northern Philippines, with dozens of others missing. Nearly half a million people had been evacuated from seven cities in Guangdong province of China, and the Hong Kong Observatory warned people to stay away from the Victoria Harbour landmark, where storm surges battered the waterfront reinforced with sandbags. 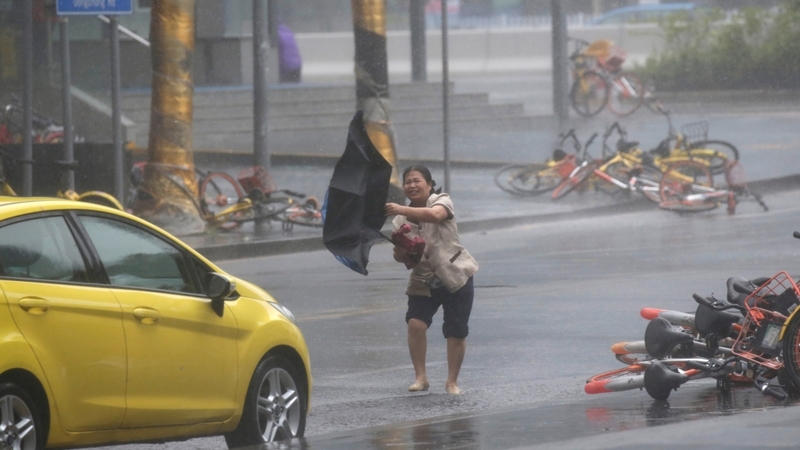 Mangkhut made landfall in Guangdong on Sunday. The national meteorological center said southern China "will face a severe test caused by wind and rain" and urged officials to prepare for possible disasters. On Sunday morning, the typhoon packed sustained winds of 155 kilometers an hour and gusts of up to 190 km/h. 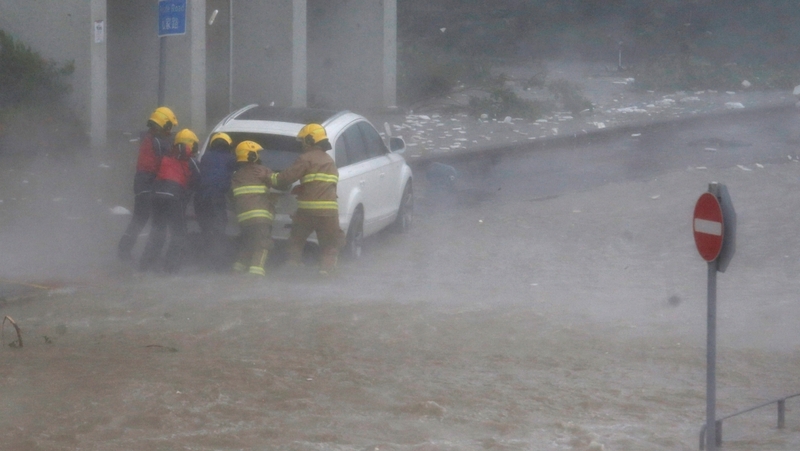 The Hong Kong Observatory said although Mangkhut had weakened slightly, its extensive, intense rainbands were bringing heavy downfall and frequent squalls. Hundreds of flights were cancelled. All high-speed and some normal rail services in Guangdong and Hainan provinces were also halted on Sunday, the China Railway Guangzhou Group Co said. Footage posted on social media showed fierce winds throwing people to the ground, swaying buildings, smashed windows and serious flooding. A video reportedly filmed in Hong Kong's Kowloon area showed scaffolding collapsing at a building site. Twitter user Jen Zhu tweeted: "When the warning says stay inside, stay inside." In Fujian province and elsewhere, tens of thousands of fishing boats returned to port and construction work came to a stop. Philippine National Police Director General Oscar Albayalde told The Associated Press that 20 people had died in the Cordillera mountain region, four in nearby Nueva Vizcaya province and another outside of the two regions. Three more deaths were reported in northeastern Cagayan province, where the typhoon made landfall before dawn Saturday. They barely had anything before the typhoon, and now they have even less. A Philippine police officer said at least 40 people, mostly gold miners, are feared to have been trapped in a landslide in the country's north and seven bodies have been dug out by rescuers. Police superintendent Pelita Tacio told The Associated Press that a part of a mountain slope collapsed on the miners' homes in a far-flung village of Itogon town in Benguet province as winds and rain pounded the gold-mining region on Saturday. Al Jazeera's Jamela Alindogan, reporting from Cagayan province, said the storm cut off power and communications in the city of Tuguegarao and devastated rural communities in the region. "We saw homes and farmland destroyed throughout rural communities. Access into these areas is difficult, which means aid may be slow to arrive, too," she said. 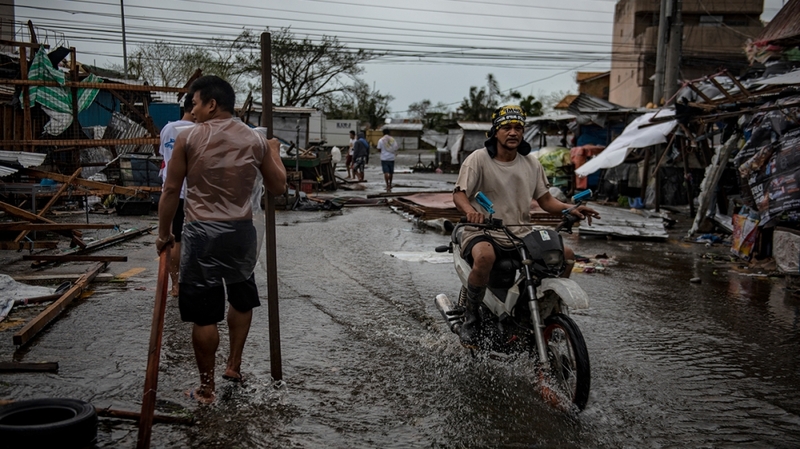 "They barely had anything before the typhoon, and now they have even less." Among the fatalities were an infant and a two-year-old child who died with their parents after the couple refused to immediately evacuate from their high-risk community in a Nueva Vizcaya mountain town, said Francis Tolentino, an adviser to Philippine President Rodrigo Duterte. Tolentino, who was assigned by Duterte to help coordinate disaster response, said at least two other people were missing. Mayor Mauricio Domogan said at least three people died and six others were missing in his mountain city of Baguio after strong winds and rain destroyed several houses and set off landslides, which also blocked roads to the popular vacation destination. It was not immediately clear whether the dead and missing from Baguio had been included in the overall death toll. About 87,000 people had evacuated from high-risk areas of the Philippines. Tolentino and other officials advised them not to return home until the danger had passed. 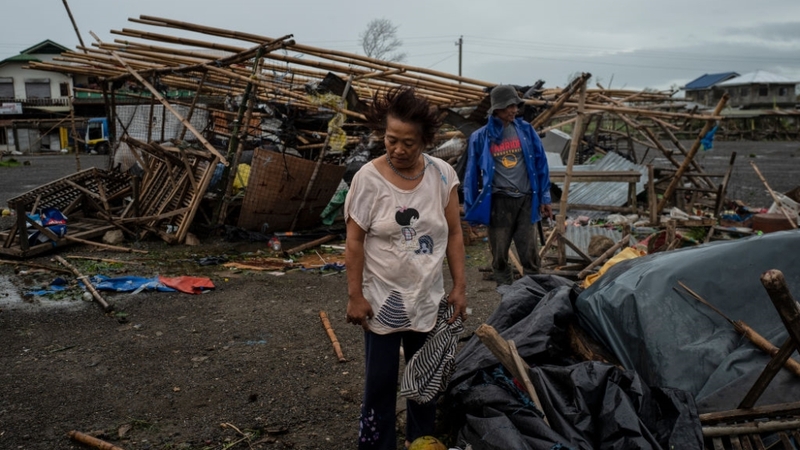 In Cagayan's capital, Tuguegarao, where the typhoon hit land, Associated Press journalists saw a severely damaged public market, its roof ripped apart and wooden stalls and tarpaulin canopies in disarray. Outside a popular shopping mall, debris was scattered everywhere and government workers cleared roads of fallen trees. The Tuguegarao airport terminal was also damaged, its roof and glass windows shattered by strong winds. The typhoon struck at the start of the rice and corn harvesting season in the northern breadbasket, prompting farmers to scramble to save what they could of their crops, Cagayan Governor Manuel Mamba said. "Because Mangkhut will bring winds and rains of extraordinary speeds, scope and severity, our preparation and response efforts will be greater than in the past," Lee said. "Each department must have a sense of crisis, make a comprehensive assessment and plan, and prepare for the worst." Hong Kong's Cathay Pacific said all of its flights would be cancelled between 2:30am on Sunday and 4am on Monday. The city of Shenzhen also cancelled all flights between Sunday and early Monday morning. Hainan Airlines cancelled 234 flights in the cities of Haikou, Sanya, Guangzhou, Shenzhen and Zhuhai scheduled this weekend. For the first time in the history of Macau, next door to Hong Kong, casinos were ordered to close from 11pm on Saturday, the South China Morning Post reported. The gambling city suffered catastrophic flooding during Typhoon Hato last August that left 10 dead and led to accusations of corruption and incompetence at its meteorological office.